Introducing our new cool way to eat golgappa – Cheese Golgappa Pakora. 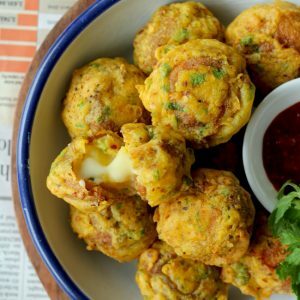 The cheese golgappa pakora is the potato masala stuffed Indian style fritters loaded with cheese. Making it a perfect party snack for the festive season. Serve golgappa pakora with my signature mint and coriander chutney to spice up the flavours on the snack table. 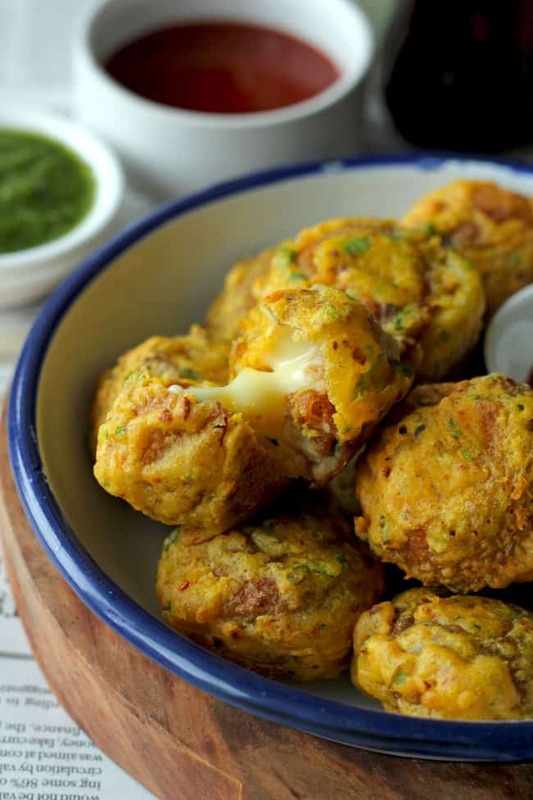 This Holi when everybody else is serving the regular pani-puri, step ahead and make cheese golgappa pakora. 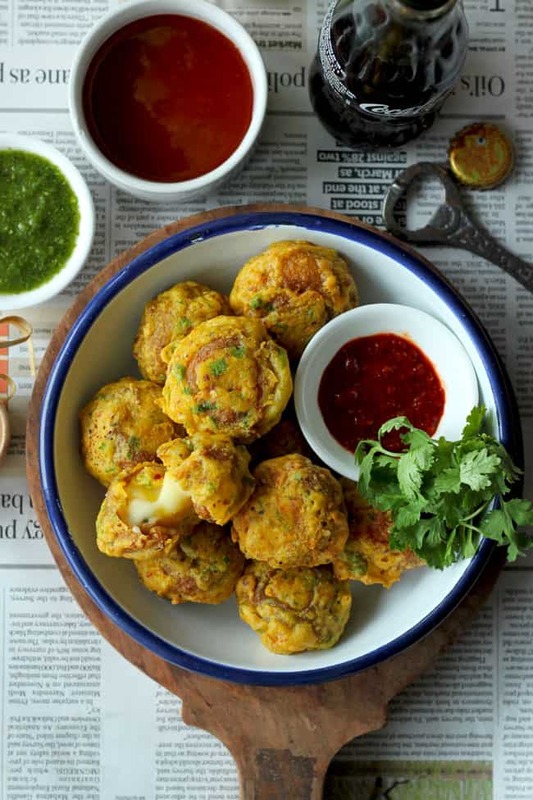 How did I even get the idea of making fritters using golgappa aka puri? 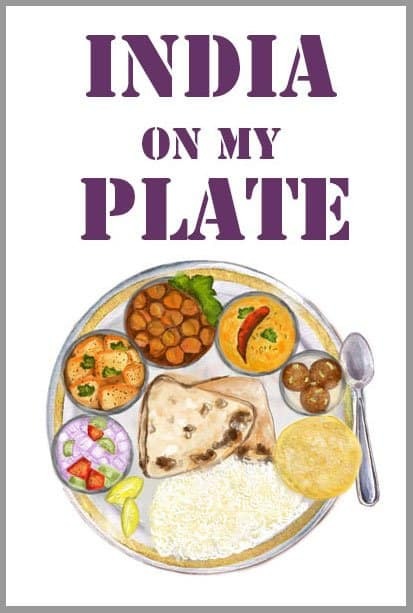 All thanks to the talented ladies in the husband’s family who always keep on trying and testing easy Indian food recipes. Apparently, these fritters are a popular snack in his family. Often served during the festive season, dinner parties or at family get-togethers. I have only added the cheesy twist to this recipe. The addition of cheese in the mashed potato stuffing made these fritters even more exquisite. These fritters taste like heaven. Perfectly crispy from the outside with a melt in the mouth kind of cheesy interior. And the best part nobody can tell with a first bite that these fritters are prepared with golgappa shells. On certain occasions, I played a quick guessing game about the ingredients of the fritters and trust me, so far nobody got them all right. Also, you can totally feel free to add seasoning, spices, herbs, and vegetables of your choice in the potato filling. In all honesty, these are so tasty as they are, they don’t need anything more! 1) Try to use a bit thick and crisp golgappa shells for the recipe. 2) You can stuff cheese cubes or any other good quality grated cheese as well inside the pakora. 3) Once you stuff the potato filling inside the golgappa deep-fry them quickly. Otherwise, the shells will soften after few minutes with the moisture of the potato filling. 4) The gram flour batter should be of a dipping consistency. It should cling to the shells but not too thick. 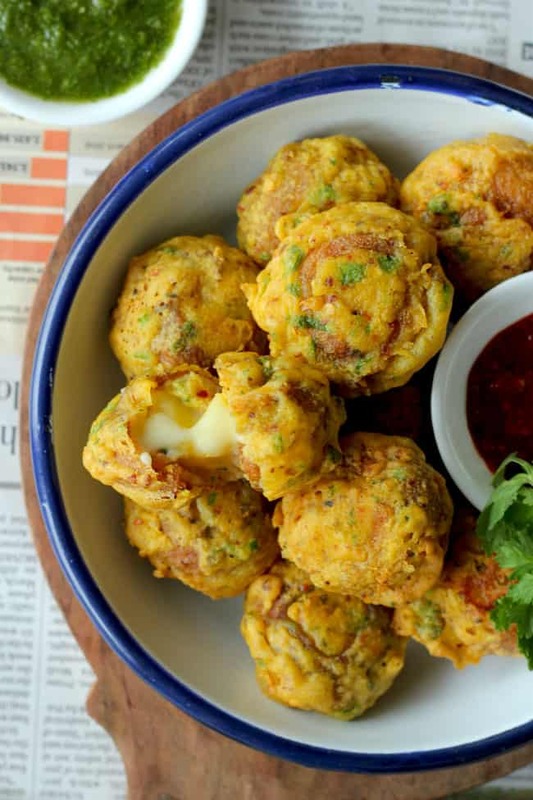 Cheese Golgappa Pakora is the unique twist to the regular golgappa. Mash the boiled potato. Add onion, salt, seasoning, garlic powder and mix. Make a thick batter of dipping consistency using gram flour, salt, chili flakes, coriander and water. Set aside until required. Gently tap on top of Gol Gappa to make a small opening in the shell. Stuff it with the potato mixture and one small cube of cheese. Similarly, prepare all the Gol Gappa. Dip each ball in the gram flour batter and deep fry till crisp from outside. Serve Cheese Golgappa Pakora with green chutney ( see recipe ) and ketchup.